West LA is famous for its trend-setting style; the place where the 'stars' live, shop and go out on the town. The area includes some of the most prestigious neighbourhoods in Los Angeles, particularly Beverly Hills and Bel Air. Home of the rich and famous, and one of the world's most expensive residential areas, Beverly Hills flaunts its wealth with luxurious manors, tree-lined streets, grand estates and security gates concealing landscaped grounds that are home to the likes of Jack Nicholson and Harrison Ford. Scheduled tours are available or Star Home Maps can be picked up at any street corner vendor for the latest on who lives where. The neighbourhood is also home to the famous shopping district centred on Rodeo Drive with expensive shops oozing designer labels such as Gucci, Armani and Louis Vuitton. 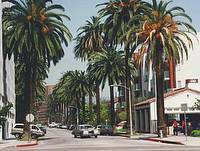 West Hollywood, between Beverly Hills and Hollywood, is the centre of LA's gay community and boasts the area's best restaurants, trendiest shops, eccentric boutiques and modern galleries along Melrose Avenue and Santa Monica Boulevard. Sunset Strip, a section of Sunset Boulevard, is famed for its nightlife with rock clubs, bars and posh hotels attracting a huge variety of characters, and many places have a history of big names. In the 1930s Errol Flynn and Rita Hayworth went dancing at nightclubs like Trocadero, by the 1970s it had become the focus of rock and roll with stage performances by the Doors and Elton John at Whisky-a-Go-Go club.